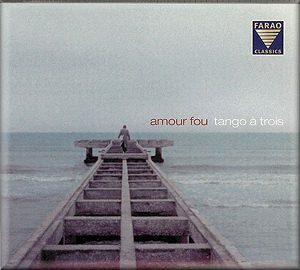 This disc, performed by a trio of violin, cello and piano aptly named Tango a Trois, contains a variety of tangos composed by Peter Ludwig, the ensemble’s pianist. Ludwig developed a passion for Tango early in his life, and began experimenting with their composition from a young age, listening to recordings of Argentinean Tango to learn the structures and forms. The style is light and convincing – this is the sort of music that would work well as background music in a bar but would capture the attention of listeners too. It deserves to be heard. The production quality of this disc is excellent, from the sound quality to the cover. Berlin, dedicated to Peter Wöpke, features the cello in resonant melodies. Cat is energetic and joyful, while the more tranquil Capverden describes far-away shores. Barandalu has an inescapable Spanish feel, with heavy rhythms and a sense of drama. Gare de l’Est describes early morning in Paris. There is something in the opening bars that reminds me of a Robert Doisneau black and white image, but as the momentum builds it seems as though we are transported into the hustle and bustle of a modern city. Rossio features a rich violin solo, expressively winding its way through the twisting melody of this ballad. Tango Zizim is an upbeat song, full of off-beats and syncopations. The cello part momentarily transforms into a jazz bass line, and the variety is highly successful. Veuve Clicquot departs from Tango towards more of a jazz style, providing a moment of repose and contemplation. Valse Dramatique is aptly described in the title, with the piano taking on a waltz-style accompaniment while the violin and cello interact with melody lines above. Following an initially relaxed section, the mood intensifies and the drama of the title kicks in. Séparée is another ballad-style work, beautifully posed and elegant, while Zirkus is frantic, fun and full of energy. Amour Fou is a wonderfully sorrowful slow tango which tugs at the heart-strings, but with just the right sense of balance so it doesn’t over-indulge. Timbaud Tango begins with a jazz-style piano solo, which gradually develops as the work continues, telling the story of Jean-Pierre Timbaud, a member of the Résistance. Miss You, the final track of the disc, is a jazz-style ballad, with violin melody and pizzicato bass line. Ludwig’s tango style is modern and seems one step away from the Argentinean original; there is a European influence here which adds an extra dimension to the music. The trio performs with a sense of enjoyment and real flair. The playing is excellent throughout, and there is an strong sense of ensemble, as though this is one performer with three instrumental colours. The music itself is highly enjoyable and refreshing. There is a feeling that these musicians have created quality music which they care deeply about, but that they don’t take themselves too seriously. This is not stuffy concert hall music; this is music to be experienced and enjoyed by the man in the street, ideally to be stumbled upon and then remembered. It does not over-intellectualize or over-sentimentalize; the balance is just right between the carefully considered compositional process and the enjoyment of its presentation. There is a warmth in the ensemble’s sound that I will remember for some time.